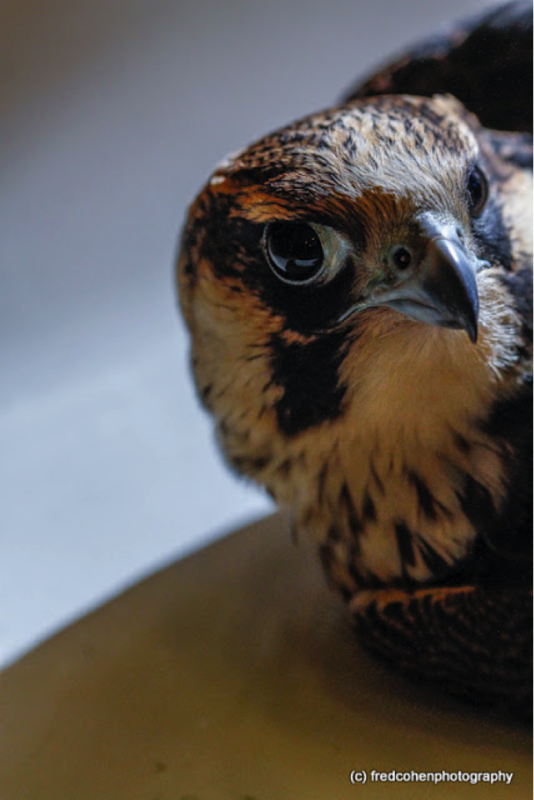 Getting up close to a peregrine falcon, the fastest bird in the world is a unique thrill, but the most exciting part about this rescue was what we didn’t find: a tag. 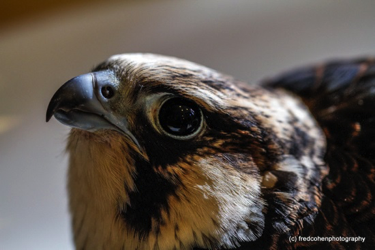 In the 1970s, peregrine falcons (Falco peregrinus) were placed on the endangered species list after their populations plummeted from the widespread use of pesticides. Since then, New York State’s Department of Conservation (DEC) has been protecting nesting sites and tagging all new birds to track their populations. The falcon that came to the Wild Bird Fund hadn’t been tagged, which means he had been born in a completely new nest. New York City is a great place to build a peregrine falcon nest. Our bridges and skyscrapers resemble the cliffs of their natural habitat, and there are plenty of pigeons and migratory birds flying through every day to hunt. 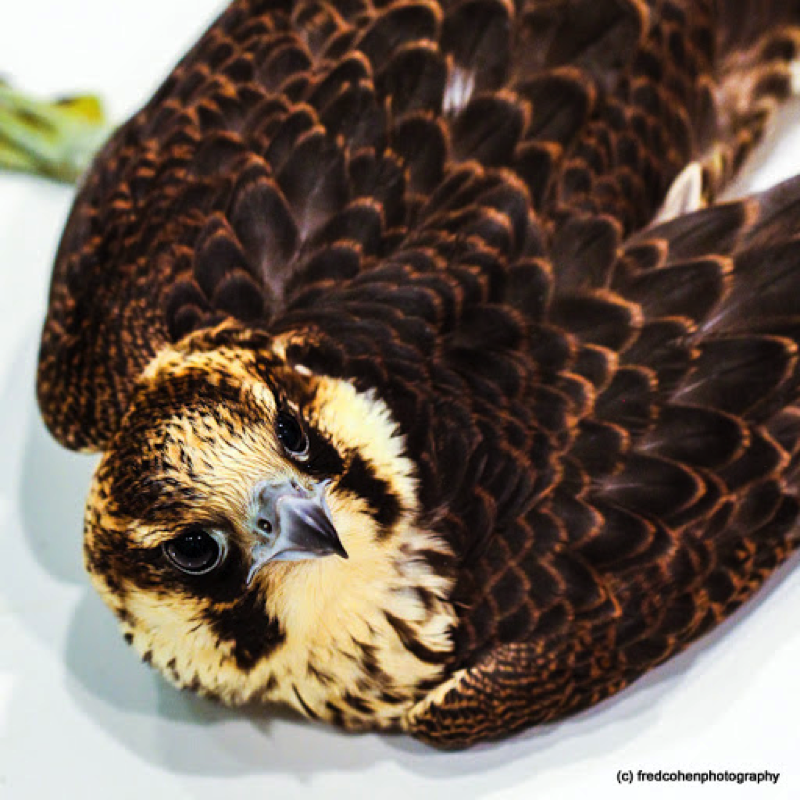 With the banning of DDT, and the careful work of the DEC, New York City now has one of the largest urban peregrine falcon populations in the world. We think this is how our patient ended up at the Wild Bird Fund. He had been picked up at the Metro Tech Center of Brooklyn unable to stand or fly. Something had hit him very hard in the air, breaking both of his coracoid bones, so he was very dehydrated and underweight. Coracoid bones are unique to birds, and are what connect the wings to the sternum, allowing them to fly. What attacks in the air with enormous force? Other peregrine falcons. The DEC surmised that our young patient had flown into another falcon’s territory and got attacked. The sheer force of a peregrine falcon dive, which can reach over 200mph, can kill a bird on impact. After two days of rehydration at the Wild Bird Fund to stabilize him for transit, and with a brand new shiny tag around his ankle, this young peregrine falcon was transferred to the Raptor Trust. He made a complete recovery and was able to be released back into the wild, adding yet another new member to this recovering species.